There was an unfamiliar sound coming from the Tulare Public Cemetery District Meeting, the sound of laughter. Between the public taking one last opportunity to get old complaints off its chest, and the occasional joke coming from the normally stoic Trustee Alberto Aguilar, Tulare Public Cemetery District got its groove back. Chairperson Vicki Gilson started the meeting by outlining how much the district has accomplished even with only a skeleton crew. The district office now has internet, is preparing to buy new software such as Quick Books and Plot box, and has increased office hours to 8am – 5pm. The board is also working out the details and pricing of offering Saturday services. With the help of county counsel, attending conferences, and personal research, the board has produced an employee handbook, by-laws, and office policy and procedures. The District’s banking procedures have now been secured and the district is preparing to issue its own paychecks instead of using Tulare County’s services. The staff also put together a map of the optimal locations for memorial benches. The board had been unable to approve any of the recent bench requests because of a lack of policy and concern that the benches were taking over the cemetery. Finally, the board decided to look into hiring another security company and also changing the broker who handles its endowment fund. They currently use Morgan Stanley and lost $6000 on the value of their fund last year. In terms of finances, Gilson put the cemetery’s budget from July to February on a display board and illustrated it experienced a deficit of $52,000. She explained that the board has a plan on turning these numbers around. Avila said that firing Stay Green, the former maintenance company, was the right decision because it was too expensive. Aguilar agreed, saying that the district cannot continue spending more money than it brings in. During a previous meeting, the board voted to do the ground’s maintenance in-house and hire a District Manager. Those decisions took a step forward when the board accepted a bid from the company Grasshopper to buy 3 new lawn mowers that included a full warranty and maintenance plan. After the regular meeting, the board went into closed session and hired Julian Puente, formerly from the Hanford Cemetery, as its new manager. Along with Puente the board also hired another fulltime grounds maintenance worker. Everyone agreed that the keystone to a successful in-house maintenance plan was a qualified District Manager. The new equipment was delivered March 23 and Puente’s first day was March 26. Both are reported to be hard at work. Avila said that with someone qualified at the helm the board won’t have to get involved in the day-to -day business of running the cemetery. He said the board is looking forward to just hiring and firing personnel and approving budgets like a normal board. Aguilar wanted to again recognize Carlene Ringuis for working as the cemetery’s volunteer office manager from September 12 to October 26. He said that she stepped up to the plate when the former office manager, Marilyn Correia, surreptitiously quit. Ringuis was subsequently appointed to the cemetery board in January. 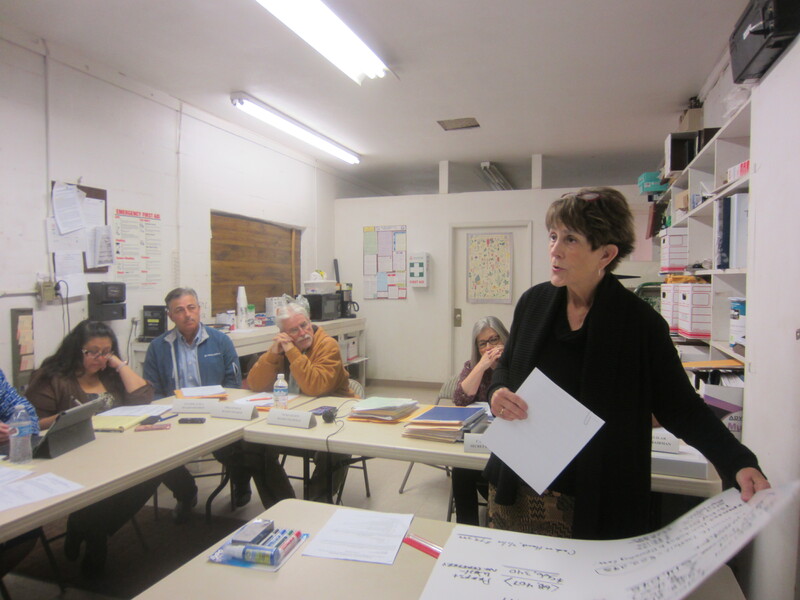 Board members have visited other cemetery districts to get new ideas and advice on how to run Tulare’s. While at the Madera Public District Cemetery, Gilson and Aguilar met Mel Lewis from Consultant Cemeteries 101 and invited him to give a presentation during their monthly meeting. Lewis has been in the cemetery business for 45 years. He said that he has gone to a lot of board meetings and he gave a lot of credit to the community for coming out and giving their input. He pointed out that this cemetery is going through a complete restart but that the new board can make a difference when it comes to increasing the cemetery’s revenue. Right now the cemetery’s has a caseload of 350 burials a year and there are strategies to raise that number. Lewis explained that the reality is that more people are choosing cremation which brings in less revenue than a traditional burial, but that the Central Valley has not been as greatly affected by this trend. California has a cremation rate of 62% while this area has stayed steady at 30% t0 35%. He also said that as Tulare returns to being a well run cemetery they will attract customers from other communities. Offering Saturday services could increase revenue and Lewis suggested customers need more choices when it comes to vaults. The vault is put into the ground before the casket so the grave does not collapse. Lewis also supported the board’s decision to hire a district manager over a basic office manager and was completely behind the decision to go in-house on the grounds maintenance. “These folks have made a decision to quit kicking themselves in the shin and move the cemetery forward,” said Lewis. It is great to read positive reports regarding this cemetery. As far as burials versus cremations I hope that the cemetery builds a great many more niches since the fenced in covered niches at the District are completely sold out. I like the niches being covered and protected from the elements. As far as security goes I hope they “actually” install a “working” camera inside the niche as opposed to a sign that says it is monitored but in truth is not. During the day I have often run into homeless people hanging out there as well as having numerous memorial items stolen. THIS IS NOT GOOD! Just wanted to clarify that I am not saying that it is the homeless people who have been stealing memorial items, it could very well be just about anyone that might see something they like and just take it. That is not unheard of. This is a positive step in the right direction. So glad to hear the administration over the Tulare Cemetary make pro-active steps toward being relevant to the needs of Tulare. Thank you. The cemetery looks like Hell still. It needs to be cleaned up ASAP. We couldn’t even find all our loved one’s because of the mess and we were just there this last Sunday! Very disappointed in Tulare! The cemetery is disgusting and has not been maintained. Doing the maintenance in-house???? Obviously it hasn’t been started. Was there yesterday and I am extremely angry and will be back today with a weed eater to clean up a lot of family plots. This is unnecessary and should be taken care of immediately!